Sanford Greene For The Win. | The Sketchcard Saloon. ← Squirrel Girl Face-Off: Cabbie Vs. Glebe. Sanford Greene For The Win. Here at the Sketchcard Saloon, we are very impressionable. Each new artist that brings fresh blood to the sketch community sets off a feeding frenzy in our eyes and our soul. This time it may never end. The sheet of original art miniature masterpieces by Sanford Greene are some of the best we have ever seen. The mad scramble to collect these unique treasures is about to begin. 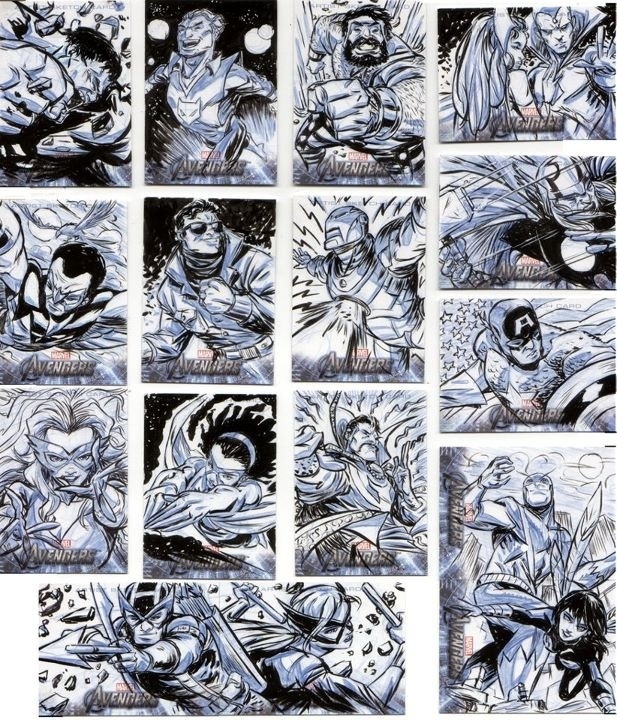 Upper Deck’s Avengers set will soon hit the streets and the world will be rocked in a way it has never known. This entry was posted in Artist Spotlight and tagged Sanford Greene. Bookmark the permalink. 1 Response to Sanford Greene For The Win. Great Sketch Cards! I’m just re-starting with sketching and hopefully someday MY Sketch cards will be in an Upper Deck Product! That would be great!